Lyme Disease affects over 300,000 new patients every year which are clustered in and around the major metropolitan regions of the Mid-Atlantic and Northeastern United States. Timely diagnosis of acute Lyme Disease depends on the accurate identification of the early erythema migrans skin lesion. Untreated, Lyme Disease can progress to disseminated infection involving the nervous system, heart, and joints.Antibiotic treatment of Lyme Disease is effective in resolving the objective manifestations of infection, however, a subset of patients develop persistent symptoms called Post-Treatment Lyme Disease Syndrome (PTLDS). 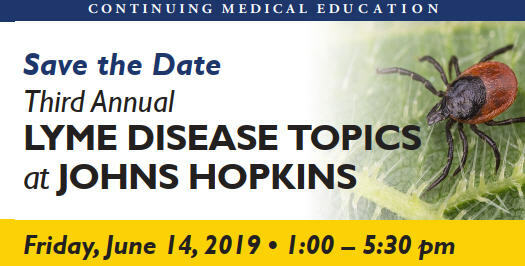 Experts from Johns Hopkins have carefully described the patient symptoms, physical findings and laboratory finding in a well document case series of patients with PTLDS.The diagnosis of all manifestations of Lyme Disease and PTLDS in the clinical practice of medicine is challenging and this course seeks to provide education to healthcare practitioners who may see patients with the spectrum of illness associated with Lyme Disease and PTLDS. Describe the clinical manifestations, current criteria and tests used for the diagnosis of the different stages of Lyme Disease. Compare and contrast the symptoms, signs and natural history of untreated Lyme Disease to those of Post-Treatment Lyme Disease Syndrome. Identify the challenges to the diagnosis and treatment of Post-Treatment Lyme Disease Syndrome.